King's Advances to the Quarter-Finals of State! MONTESANO — Behind Thomas Vincent’s rushing and an opportunistic defense, King’s derailed the previously undefeated Montesano Bulldogs on Friday and cruised into the quarterfinals of the 1A football state playoffs. Vincent finished with 270 yards rushing and four touchdowns on 29 carries. The senior quarterback also completed five of seven passes for 42 yards with a touchdown. He threw one interception. The key to the first-round game was turnovers. After King’s scored on its opening possession, Montesano muffed the ensuing kickoff, giving the Knights the ball in the red zone. One 15-yard touchdown pass later and a team that wasn’t accustomed to a deficit found itself trailing 14-0 before its offense had even touched the football. Then, just when the Bulldogs were about to get back into the game having driven to the Knights’ 6-yard line, they lost another fumble. Four plays later, King’s was in the end zone again. King’s finished with 352 total yards, 310 of which came on the ground. Montesano wound up with 307 total yards, but also with four very costly turnovers. Defensively for the Knights, safety Curtis Clauson led the way with eight tackles and a fumble recovery while Roko Gucake forced two fumbles. King's 53 - Orting 12 (district game - - winner to State!) ORTING — King’s coach Jim Shapiro said Orting tried to take away the Knights’ explosive passing game during their winner-to-state, loser-out 1A tri-district playoff game. That objective was accomplished as the Cardinals held King’s to just 77 yards through the air. However, the grand objective — winning the game — was not accomplished as King’s exploited Orting’s umbrella defense to the tune of 459 rushing yards. Knights senior quarterback Thomas Vincent led the rushing attack with 16 carries for 234 yards and four touchdowns. He finished five of eight passing for 77 yards. Zack Evans also had more than 100 yards on the ground as the junior rushed for 115 yards and three touchdowns on 15 carries. Following a fumble recovery in the second quarter, the Knights scored three touchdowns in a two-minute span to turn a 7-6 lead into a 26-6 blowout. King's 36 - Lynden Christian 12 (district game) SHORELINE — An opportunistic defense helped King’s win a 1A District 1 playoff game despite having its offense outgained by Lynden Christian 361 to 313 total yards. Each of four Lynden Christian turnovers gave the Knights a short field. Two of the key players for the King’s defense were senior defensive back Joseph Jaeger, who contributed two interceptions, and sophomore inside linebacker Chris Jenkins, who had 14 tackles. Offensively, the Knights were led by quarterback Thomas Vincent, who had 91 yards rushing to go with a 10-for-20, 163-yard, three-touchdown passing effort. The victory advanced King’s to the 1A Tri-district playoffs as the District 1 No. 3 seed. Lynden Christian was eliminated from playoff contention. King's Wins Shootout w/ Lakewood 46-44 Lakewood - The game came down to the last few minutes of play, but the Knights held off a late charge by Lakewood to bring home another Cascade League victory. The post-game fireworks were intended for Lakewoods' homecoming - - but the Knights took in the sights and relished the moment. King's 35 - South Whidbey 0 SHORELINE — It’s difficult to steal the spotlight from senior standout quarterback Thomas Vincent in a King’s football game but Curtis Clauson may have done just that in a Cascade Conference victory. The 6-foot, 150-pound receiver seemingly couldn’t be brought down by the Falcons on the way to a 11-reception, 180-yard performance. Vincent completed 17 of 24 passes for 275 yards and added two rushing touchdowns. Junior defensive end Roko Gucaka was a big reason the Falcons didn’t make it on the scoreboard. Gucaka recorded four solo tackles and 11 assists. King's 43 - Cedarcrest 9 DUVALL — King’s got five total touchdowns from senior quarterback Thomas Vincent in the Cascade Conference game. After a 40-yard kickoff return, Vincent and the King’s offense setup shop at midfield and Vincent immediately connected on a 50-yard touchdown pass with wide receiver Curtis Clauson on the first play from scrimmage. Vincent passed for 161 yards, completing 10 of 18 attempts for two touchdowns while rushing 10 times for 161 yards and three additional touchdowns. Clauson, the senior receiver, had six receptions for 114 yards and two touchdowns. Chris Dowd scored Cedarcrest’s only touchdown in the third quarter on an 8-yard run while Jared Klingenberg ran for a team-high 119 yards. 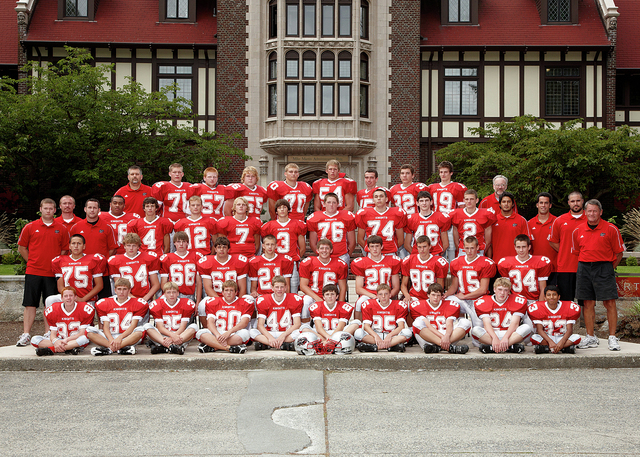 King's 42 - Sultan 7 (9.17.2010) SHORELINE — Curtis Clauson caught seven passes for 139 yards and three touchdowns and teammate Thomas Vincent completed 10 of 18 passes for 190 yards and three touchdowns and rushed for 107 yards and a TD on 12 carries. Defensively, Zack Evans had six solo tackles, three for losses, and four assists. 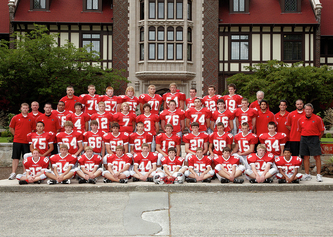 King's 59 - Coupeville 6 (9.10.2010) SHORELINE — King’s senior quarterback Thomas Vincent led the Knights to a dominating Cascade Conference win. Vincent finished 13-for-23 passing for 229 yards and four touchdowns. He also ran for a touchdown. His main target, Joseph Jaeger, had seven catches for 153 yards and three touchdowns. King’s finished with more than 500 total yards of offense. The Knights’ defense also put together a solid performance, holding Coupeville to 110 yards of total offense. King's 55 Lakeside 7 (9.3.2010) SEATTLE -- Manny Perry's block enabled Curtis Clauson to return the opening kickoff 88 yards for a touchdown, setting the tone for the Knights' non-league rout. Clauson also caught four passes for 89 yards and three TDs. King's quarterback Thomas Vincent completed seven of 11 passes for 123 yards and three TDs. He ran the ball four times for 87 yards and a TD. Zach Evens led the King's defense with five solo tackles, three assisted tackles and a fumble recovery.